Key Energy Crop Harvesting Milestones & Performance Indicators in each of these feedstocks are shown in this table. Having another successful biomass harvest season under our belts is further evidence that our in-field harvesting and supply chain systems are making the process easier and increasing productivity. Genera Energy Inc., a leading biomass supply company specializing in biomass feedstocks for advanced biobased industries, set new standards for efficiency with its recently completed harvests of miscanthus, switchgrass, and biomass sorghum. With this harvest, Genera continues to optimize its efficient year-round, just-in-time biomass harvesting and delivery systems. Incorporating multiple feedstocks into the year-round supply chain offers obvious benefits but also introduces unique challenges in equipment scheduling, logistics, inventory management and other critical elements of the supply chain. Building on six years of focused development and testing of efficient harvest systems, Genera’s team has further tested and refined new harvesting equipment and procedures at commercial scale during this harvest season. “This continual improvement and validation adds value to the industrial-scale systems we implement for our customers, not only reducing cost, but more importantly reducing feedstock supply risk,” said Keith Brazzell, COO of Genera. This year’s harvest signals a major milestone in biomass harvest practices. Genera’s single pass forage harvest system, also known as a field chopping system, set new records this year for switchgrass harvesting efficiency. Not only are time, equipment needs, and costs reduced in the field, forage harvesting allows for reduced preprocessing and handling costs for the end user as the field chop exits the field at relatively small particle sizes in a dry, bulk flowable form. In addition to field chopping, Genera also demonstrated improvements in bale harvest systems for both biomass sorghum and switchgrass, utilizing a self-propelled swather and a large square baler. 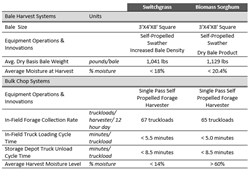 Genera successfully demonstrated a method for in-field drying to reduce the moisture content of biomass sorghum to below 25 percent, allowing more conventional baling and longer-term storage. For more information on Genera, visit http://www.generaenergy.com. Genera Energy Inc. supplies biomass feedstocks for the advanced bio-based industries, offering scalable industrial scale agriculture biomass supply solutions ranging from full service energy crop production to customizable supply chain solutions and managing biomass supply. Genera’s proprietary Supply ASSURE™ feedstock management system and its BIN-SPEC™ material handling and milling system offer Genera’s customers maximum feedstock reliability and quality while minimizing variability and cost. Based in Vonore, Tenn., Genera operates the country’s largest and most comprehensive industrial biomass management and processing facility. Focus on innovation and sustainability in delivering industrial biomass supply systems has earned Genera the World’s Biofuels Market’s prestigious 2013 Sustainable Feedstock Innovation Award. For more information, visit http://www.generaenergy.com. 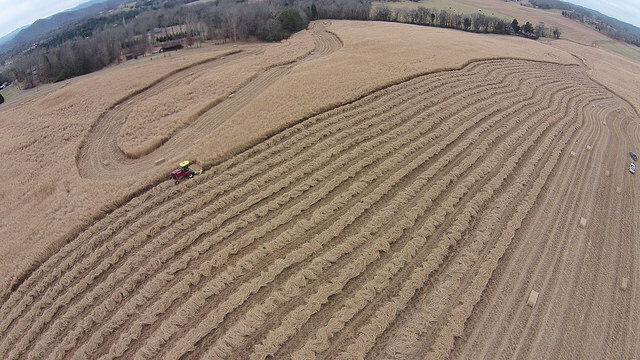 Aerial shot of Genera's recent switchgrass harvest in process.